First we need to understand, what is the need of metering or billing application in any application especially in Cloud Computing? We need to collect per customer usage. We need an API to query collection data from existing billing system. OpenStack data needed per customer, with an hour level. In “Compute Nova” we need to collect data on below activities. From network (date in/out) we need to collect, hourly bytes + total bytes. Need to differentiate between internal and external end-points. From Storage – Swift side, need to collect data on total data stored, data in/out – hourly byte + total byes and need differentiate between internal and external end-points. For above use cases OpenStack has introduced a metering tool in its latest release “OpenStack Havana” called Ceilometer. The OpenStack Metering service aggregates usage and performance data across the services deployed in an OpenStack cloud. This powerful capability provides visibility and insight into the usage of the cloud across dozens of data points and allows cloud operators to view metrics globally or by individual deployed resources. There are some free Software Billing Systems also available in market. Here is a list of the billing system implementations that could use the Metering system when it becomes available. nova-billing – The billing server stores state information for miscellaneous resources (instances, volumes, images, etc.) in a database and generates reports accessed by REST API. 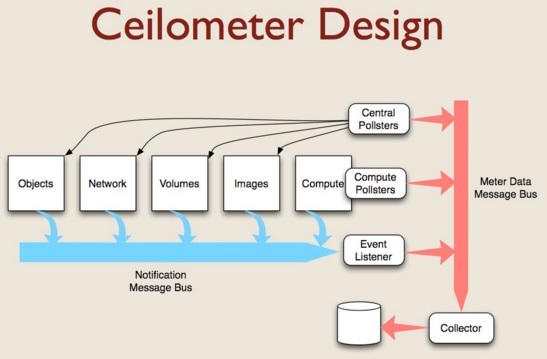 The Ceilometer – aims to become the infrastructure to collect measurements within OpenStack so that no two agents would need to be written to collect the same data. Ceilometer’s primary targets are monitoring and metering, also framework can be easily expandable to collect for other needs. To that effect, Ceilometer is able to share collected data with a variety of consumers. v1 delivered with Folsom with all functions required to collect base metering info and provide standard API access. v2 delivered with G as an incubated project with (subject to variation). End-User API access to own metering information. Integration of information summary as an Horizon plugin. Multi publisher to handle other usage for data collection. In short we can say – Ceilometer is an instrument that measures cloud coverage. Some useful links of Ceilometer.